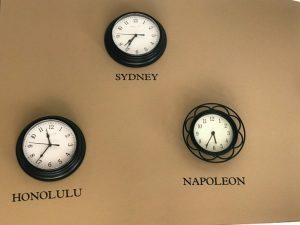 I love unique clocks. On the bulk head above the columns that separate my dining room and living room, I keep the collection of my clocks. When I look at them, I can remember a story about each one – where I bought it or who gave it to me. The surf board is from our visit to Santa Monica and the old fashioned camera is from our trip to Alaska. The octopus and the HOME clock were gifts from my daughters. The Elvis clock was purchased while we were in Memphis, TN making our very first bucket delivery for Bucket Buddies Mission to St. Jude’s Children’s Hospital. The other side of the bulk head has clocks displaying times from different cities around the world. This weekend I spent an hour changing batteries, resetting times and dusting all of those clocks. I don’t know how many times I asked myself “what time is it?” as I was changing those clocks. And today I ask myself the same question only in a different context. What time is it? I will tell you what time it is for me. It’s time for me to stop wallowing around and being aggravated with my job. Things aren’t always going to be “peachy” and it’s time I realize that I’m not there to just manage the trademarks, review marketing literature and approve invoices. I’m there to try to make a difference to people by being positive and showing kindness and love to those who need a friend. I’m there to be a light for Christ instead of a negative complainer. It’s time for me to quit allowing negative people to bring me down. It’s time for me to bring light into a dark situation. Is it time to put down the ax and stop grinding? Is it time to reach out to the wayward child and give a hug? Is it time to forgive the unforgivable friend? Is it time to pick up the phone and call your distant parent? Is it time to give up that addiction? Is it time to get healthy? Is it time to start your weight loss journey? Is it time to be kinder and less grouchy? Is it time to accept Christ? Is it time to get back on the path to living for Him? I have no idea what time it is for you but what I do know is that today is the day and it’s time to quit putting off what you know you need to do. I didn’t wake up to see what time it was at 4 a.m. to not be able to go back to sleep for nothing. This blog was weighing on my mind and heavy on my own heart. I knew it was time for me to snap out of it and get back to serving the Lord. What time is it for you? Whatever your “IT” is ……….it’s time. This entry was posted in devotional, inspirational, motivational, spiritual on September 26, 2017 by Deanna Young.